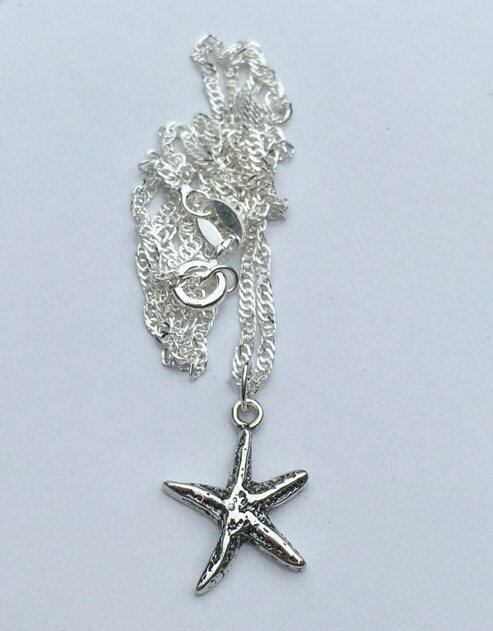 A gorgeous sterling silver starfish charm hangs from a 16" shimmering Sterling Silver chain. A 2" extender can be added upon request. This nautical sea star necklace will go with anything! Simple and cute. This necklace will be shipped in a gift box via USPS First Class Mail. Such a smooth and raised, delicate and feminine Puerto Rican sea glass with a sweet narrow band. There are no sharp edges on the metal —exquisitely done! I was in awe when the ring arrived as it was/is more beautiful than photos! The pinkish purple sea glass is stunning! ❤️ It! Wonderful designer! Will buy more!